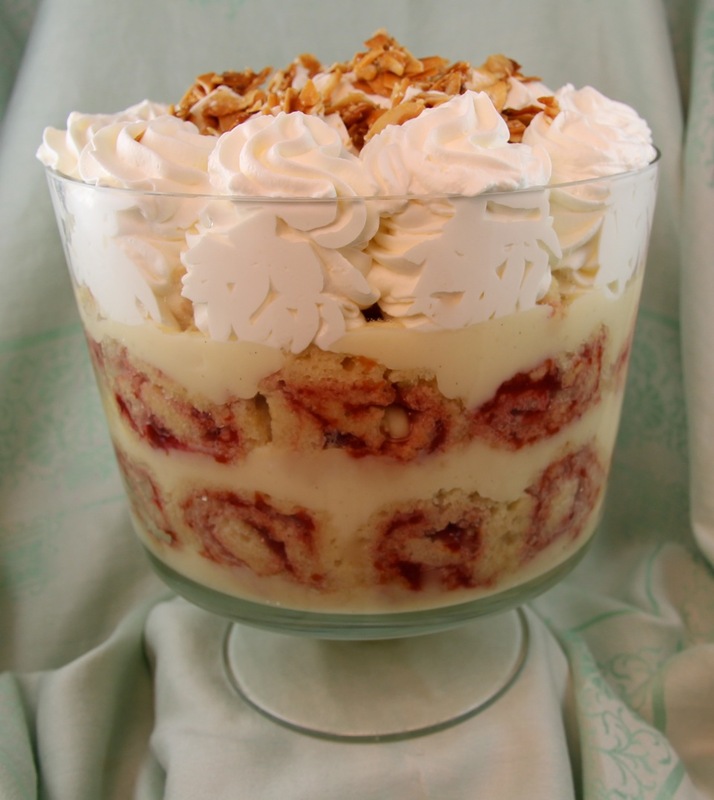 This trifle features the flavors and textures of an almond paste cake, sour cherries, vanilla pastry cream, whipped cream and candied almonds. Great party dessert as it it is even better when made ahead. You can read the story of its creation at Not a Mere Trifle. For the Candied Almonds: Line a half-sheet pan with parchment paper or aluminum foil and coat lightly with nonstick spray. Place almonds in a dry, heavy skillet and cook over medium heat, stirring frequently, until almonds are warm. Add confectioners sugar and continue to cook, stirring frequently, until almonds are lightly toasted, sugar caramelizes and coats the nuts, about 3 minutes. Immediately scrape out onto prepared pan and spread into as thin a layer as possible. Cool completely. Nuts may be broken up and stored at room temperature in airtight container for up to 4 days. For the Pastry Cream: Make a double batch of either the Firm or Rich Pastry Cream (either will work) as directed, up to 3 days ahead. May be refrigerated until needed. For the Cake: Preheat oven to 350°F. Position racks in upper and lower third of oven. Coat two half-sheet pans with nonstick spray, line with parchment, then spray and flour the parchment. Crumble almond paste into food processor fitted with metal blade. Pulse until coarsely ground, then add 1/3 cup sugar, 1/3 cup flour, and salt and process until very finely ground. Pulse in egg yolks, milk, and extracts and transfer to a large bowl. Beat egg whites in a clean, grease-free bowl with electric mixer at medium speed until frothy. Add cream of tartar and continue beating until soft peaks form. Gradually add remaining sugar, beating on medium speed until whites are stiff and hold glossy peaks. Fold about one third of whites into almond paste batter to lighten, then fold in remaining whites gently but thoroughly. Fold in remaining flour until no streaks remain. Divide batter between pans, spreading evenly with an offset spatula. Bake about 15 to 20 minutes, or until pale golden and a toothpick inserted in the center comes out clean. Cool in pans on racks until just warm. Invert onto racks lined with a clean piece of parchment. Carefully peel off original parchment and cool completely. While cake layers cool, pulse preserves in clean food processor bowl fitted with metal blade until smooth. For Assembly: Stir water and sugar together in a saucepan and bring to a boil, swirling once or twice until sugar is dissolved. Add sherry, simmer for a minute, then cool completely. Have all the components ready. Spread a thin layer of preserves on each cake. Cut each cake in half crosswise, which makes them easier to roll. Beginning with a short end (was the long side), roll up each piece tightly to form a spiral log. Cut each log into ½-inch thick rounds and set aside. Spoon a scant cup of pastry cream into bottom of trifle dish and spread to edges. Press spirals snugly against side of dish along bottom edge until you complete a ring all the way around. Fill in center with whole rounds. Brush all exposed cake really generously with syrup. Top with remaining custard and repeat with another ring and layer of cake spirals. Again, brush all cake with syrup. Let it soak in and brush on a second time to use it all up. Wrap with plastic wrap and refrigerate overnight. Beat cream, Sherry and sugar just until soft peaks form. Spoon over top of trifle or use a large star tip (as I did in picture) to cover top with large rosettes. Sprinkle with candied almonds and serve.